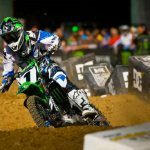 Ryan Villopoto won his fifth race of the season while James Stewart took second place to just barely remain in contention for the 2014 AMA Supercross title. 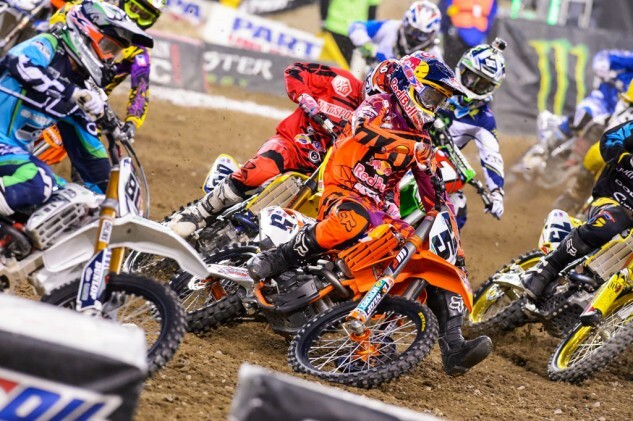 Meanwhile it was a bitter-sweet podium for third-place finisher KTM‘s Ryan Dungey who was officially mathematically eliminated from title contention. 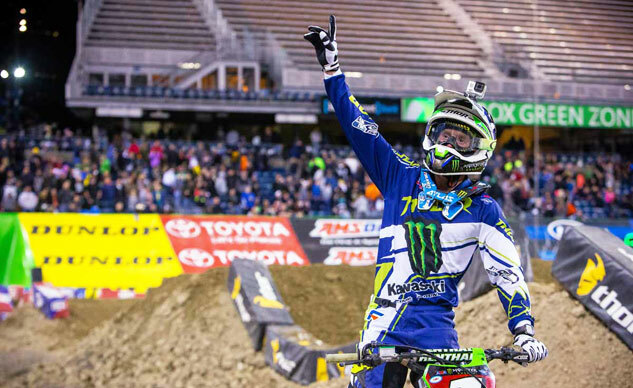 Racing in his home town of Seattle, Wash., Villopoto led every lap en route to an easy win, his fifth of the season. 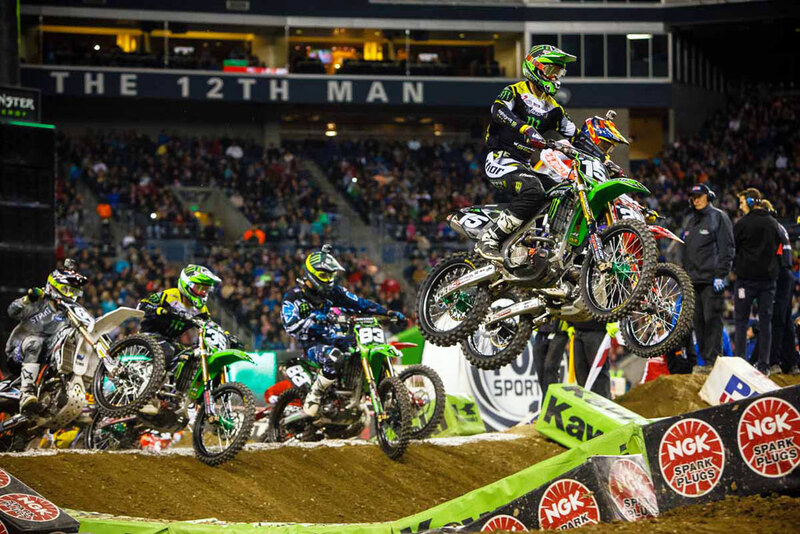 The Kawasaki rider could have cemented the championship in Seattle if it weren’t for Stewart’s second-place finish. 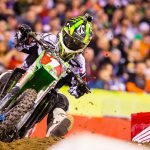 With two rounds remaining and Villopoto leading Stewart by 48 points, the three-time reigning champion needs to score just three points to take a remarkable fourth consecutive title. Villopoto took the holeshot, but only just barely, ahead of Dungey through the first corner. It didn’t take long however for Villopoto to pull away. Meanwhile, Stewart began to close the gap with Dungey, pushing his Yoshimura-backed Suzuki into second on Lap 4. By that point however, Villopoto was about three seconds ahead, a lead he would continue to stretch before completing the full 20 laps with a 12.148-second cushion. Stewart took several risks, trying to extend his jumps to make up some time, taking some hard landings on his front wheel. Stewart nearly crashed on several occasions, but at this point in the season, he could not afford to hold anything back. 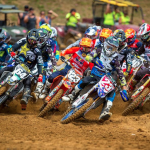 Troy Lee Designs Honda rider Cole Seely led all 15 laps to win the Western Regional 250 class main event. Seely held a lead as wide as 10 seconds before settling for the win 4.569 seconds ahead of points leader Jason Anderson of Rockstar Energy KTM. Kawasaki’s Justin Hill finished third for the final podium position. The 2014 AMA Supercross Championship heads back across the continent to East Rutherford, N.J., with Villopoto holding a comfortable cushion needing just an 18th-place result to clinch the title. Stewart still has a mathematical shot at the title but barring a dramatic shakeup, the title belongs to Villopoto.